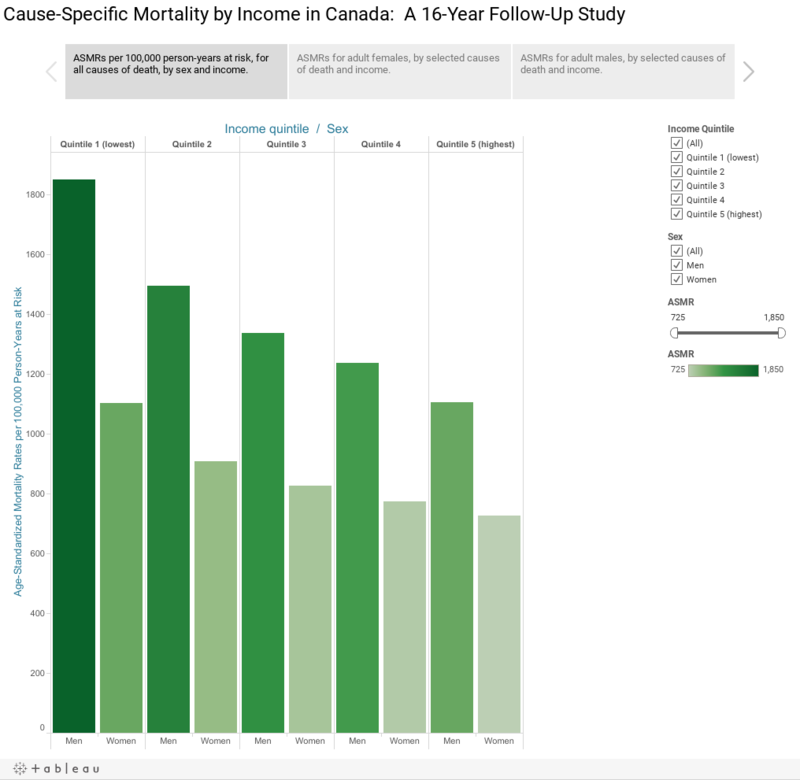 This visualization presents a study conducted by Tjepkema, Wilkins, and Long (2013), and it examined the causes of death among Canadian adults at different income quintiles. It calculated the age-standardized mortality rates (ASMRs) for a sample that equals to 15% of Canadians aged 25 or older. It used data from the 1991 to 2006 Canadian census mortality follow-up study, which included about 2.7 million people. The causes of death were grouped by the Global Burden of Disease categories, and by behavioral health risk factors, including smoking-related, alcohol-related, and drug-related diseases. Taking into consideration the varying housing costs among different areas, income quintiles were calculated for each census areas. Tjepkema, M., Wilkins, R., & Long, A. (2013). Cause-specific mortality by income adequacy in Canada: A 16-year follow-up study.